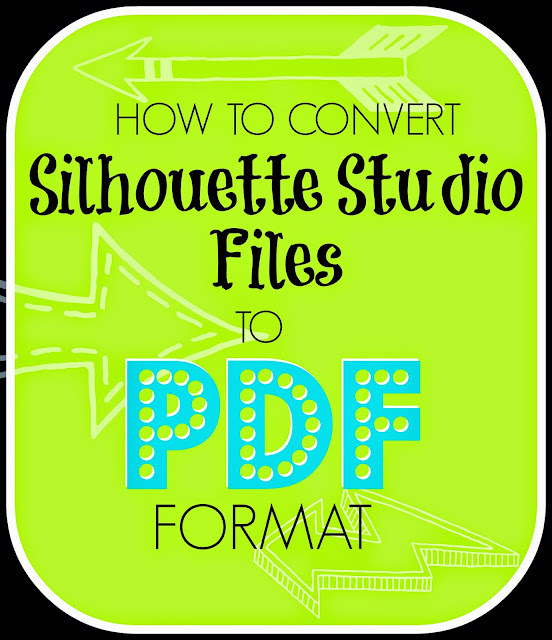 Did you know it's easy and fast to convert Silhouette Studio files to PDF format? 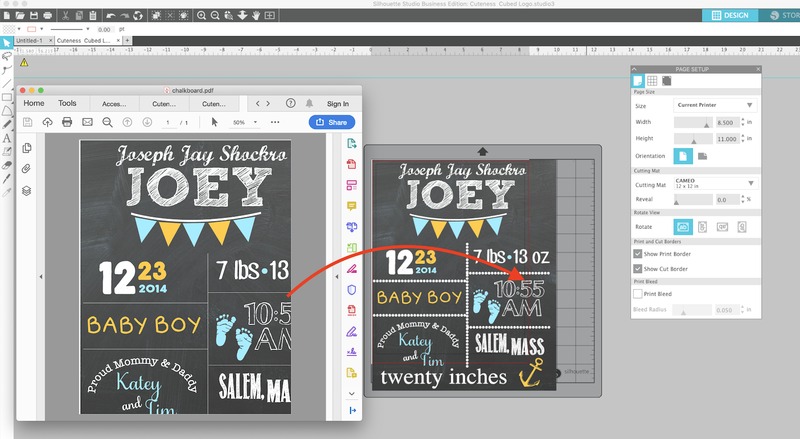 You can do Save as a PDF from Silhouette Studio two different ways depending on the software version and upgrade you have. 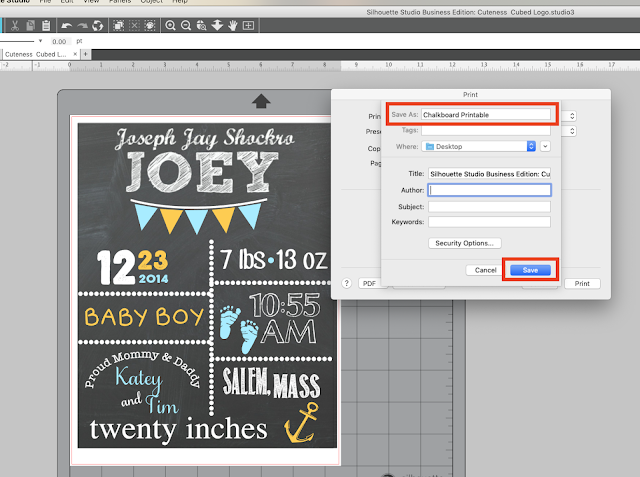 What you want to do is create your design in Silhouette Studio as you normally would. 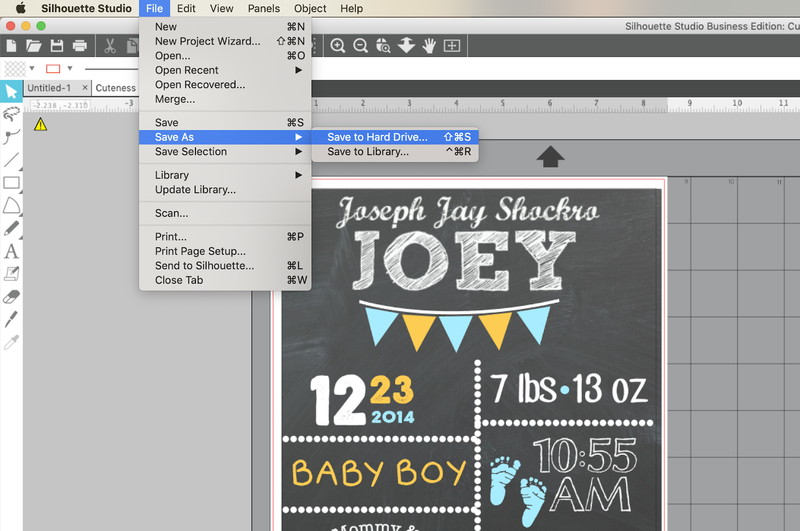 Keep in mind you need to make sure that everything you want saved to the PDF is within the Print and Cut borders. Both can be turned on from the Page Set Up tool. Anything outside those areas will not be saved as part of the PDF. If you have Silhouette Studio V4 with Business Edition you can save as a PDF by going to File > Save As > Save to Hard Drive. In the window that pops up, change the file "Format" to Portable Document Format (PDF). 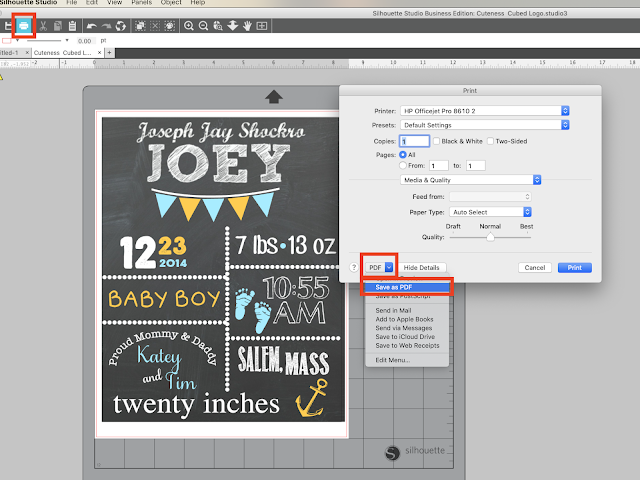 If you do not have Silhouette Studio Business Edition (or if you have not updated to Silhouette Studio V4), you'll need to use the Print tool to export a PDF from Silhouette Studio. Click on the printer icon as if you are going to send your design to the printer. (Don't worry, you're not going to print.) On the pop up window, you'll see the little PDF button at the bottom left. Click it and you'll get a drop down mention with the option to Save as PDF. You can then re-name the file if necessary and Save to save the PDF to your computer's hard drive. That's all there is to it. You can navigate to where your file saved and see that it's in PDF format and will open with Acrobat Reader. 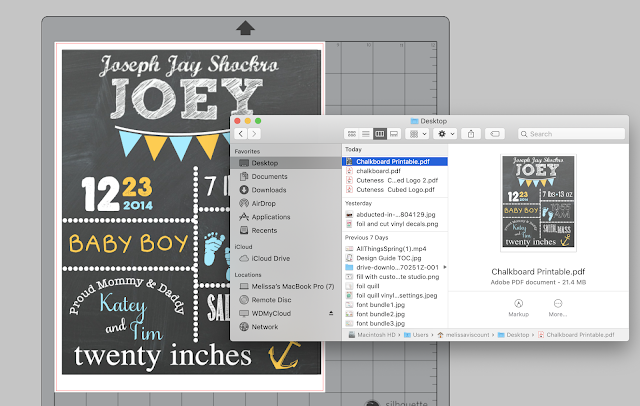 Window users, check out Clever Someday's tutorial on converting Studio Files to PDFs. This does not work with my computer (not a Mac). I just get the normal print box like I do with any program I am printing from. Do you need to have the Designer's Edition to do this? I love this tutorial. Thank you. I am trying to make a mother's day print for a regular sized paper, but the print border makes my background not reach the sides of the paper after I save as a PDF. I also have my "borderless" option selected and even though my print goes to all edges of the paper, when I save as a PDF, my print has white .5" edges all around it. Any suggestions? I love this tip too! Thanks for posting. I am similar to Angela above though... when I save as pdf and then open it, the image is not centered on the page anymore as it was in silhouette. Any ideas on this. I keep having to go back to my silhouette doc and manually adjust the image left, right, up, down and resaving as pdf until I find it looks centered on my pdf doc. Also wondering if you know how to save an image larger than letter size so it will show up and print on pdf. THANKS for the tip! I too only get the normal print window. I'm using a pc and basic studio software. Can you please advise me on how to get the odd option. Thanks so much!!! I do not have this option. I have a windows machine. Is there a way for me to print to PDF? Good work. Thank you for sharing this guide about converting Silhouette Studio files to PDF. My file is bigger then the standard (11x8.5). How can I save a bigger file as a PDF without it cutting it off? I'm also wondering this as well! Did you figure it out?? I keep getting black boxes on my file..... they are not on the original so I am not sure where they are coming from but when I open the pdf they are there, any ideas? Nikki were you using the free version and getting this result? Thai you so much! This is so easy! I was getting mad trying to do it!! I have been using 'print -> as pdf' for tons of years! on my mac on a daily basis, w/o a plotter. (no need to write .pdf, it gets added automatically) On windows you first need a printer add-on that prints to pdf. For the next step just use the app preview! e.g. 'export to jpg'! Too bad those great features are not known more widely. Anybody else having a problem with the hidden grid lines? I just saw your post. I am having the same issues with the grid lines. If I find a solution, I will let you know. Someone gave me this solution…And it worked great. PlaidKat, what a great solution, thanks a lot, you made my day! I am on a Macbook Pro. When I save my file to .pdf and then open it, it shows the grid marks. I design without a grid. What do I need to do differently? I am having the same problem! Did you ever find a solution to the grid lines? see above, I used the preview in Lion and it helped, but cannot find it anymore in ElCapitan. so what I do is a screenshot, and it it has the lines I move the design outside before taking the screenshot. last time when I checked "no grid" in silhouette it worked fine for me. I am using the standard edition of Silhouette Studio. Does this conversion not work for this edition? Please help!!! Wow! This was so easy. You just saved my day. Thank you! Hello, Thank you for this great tutorial. Really makes my life so much easier. 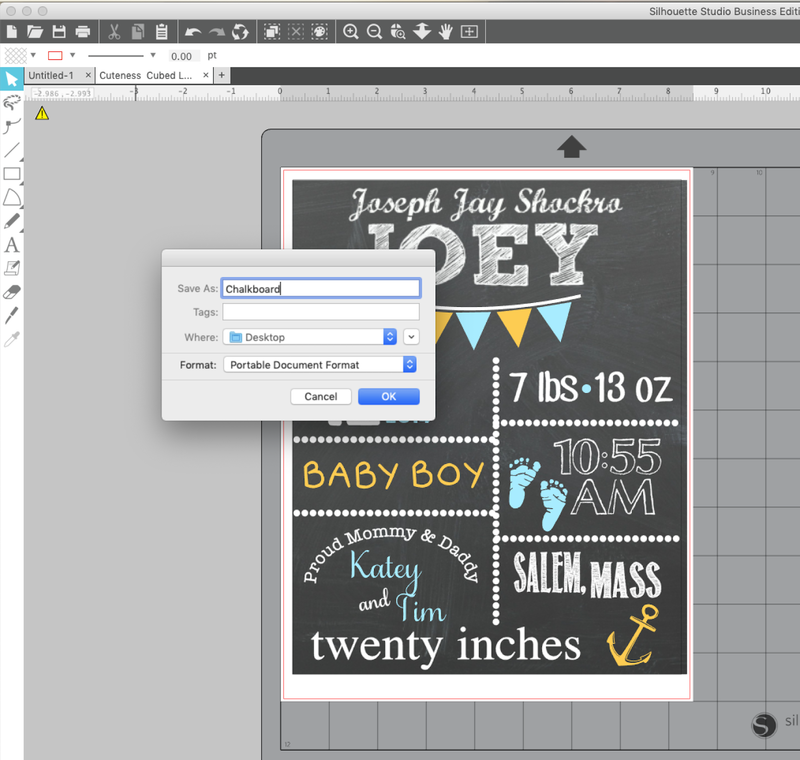 Has anyone figured out how to place oversized images so that it will come out nicely on multiple Letter-sized pages? I design quilting patterns and need to know how to do this. Thank you. You can try http://www.pdfcoding.com/online/pdf/convert-pdf-to-tiff/ for high quality asp.net convert tiff to pdf. Even there is 10% discount on the first order. Thank you so much for this tip!! I used Silhouette Studio to design something the way some people might use PhotoShop. I turned it into a PDF no problem, and the next step is to print it out! Thank you! Does this only work for MAC? when I tied to do this, it did not give me the option to change to PDF it was just a normal print screen without any options. When I clicked on the link you provided for Microsoft and it did not work. This is a GAME. CHANGER. Thank you! !